Most Australians understand that when you vote in the Senate, you’re voting for a State representative. Your vote, along with all the other votes in your State elect a group of Senators. You might not know quite how many, but you understand the concept. The people who wrote our Constitution designed the Senate as the States House of our Parliament. Each State has an equal number of Senators, which was a compromise at the time to get the Constitution through. The smaller states wanted to ensure that they would not be disadvantaged by their small populations. So at federation the State of Tasmania, with the smallest population, had six Senators, an equal number to NSW which was (and still is) the most populous State. Over time the number of Senators has increased to 12 in each State. The two internal Territories have a different deal under section 122 of the Constitution and each have two Senators. Our political party system was in its infancy at federation, but over time parties have dominated politics and the State role of the Senate has been altered. Senators often vote along party lines rather than State lines. In recent years as the number of minor and micro party Senators has increased we have seen some Senators once again claiming to be loyal to their State by voting in particular ways on particular legislation. Each state has 12 Senators who sit for six years (section 7) and the two internal Territories have two Senators who sit for the term of Parliament. This makes a total of 76 Senators. Currently the Senate is missing a few of the 76 Senators. We have one Senator who has taken a leave of absence, another who has quit, plus we have two that are on secondment to the United Nations in New York and one is recovering from surgery. This does mean that South Australia only has 10 representatives in the Senate and Western Australia, Tasmania and NSW each have 11. When Senators are unwell or have a good reason for being away from the Senate a pair will normally be provided. A pair means that a Senator from the opposite side sits out during the vote on the floor. This is why important legislation was passed this week with only 36 yes votes (normally you’d need 39). The Government still needs most of the minor and micro party Senators to vote with them to pass legislation if the Greens and Labor Party oppose. Before Bob Day quit, the Government needed the votes of nine out of the 11 minor party Senators. They now need eight of the 10 left to vote with them for legislation to pass. The Xenophon team (NXT) hold three votes and One Nation hold four. This means that to pass legislation the Coalition need the support of both these Parties. They also need to gain the votes of one of the three minor Parties left. These being Jacquie Lambie, Derryn Hinch and David Leyonhjelm (unless One Nation splits its vote and then the Government needs two). To pass any legislation the Government need to find bipartisanship with the Labor party, appeal to the Greens (as they did this week on the backpacker legislation), or otherwise it needs the support of the minor and micro Parties. It annoys some Australians that legislation is sometime held up by small Parties (people don’t seem to mind as much if the Greens or Labor hold up legislation). But our system of Government and our Constitution was designed for this to happen. The principle of Separation of Powers makes our Parliament one of the three great powers in Australian democracy. The Parliament is a check on the power of the Executive Government. To become the Executive, the Government must hold a majority (on their own or in a coalition) of seats in the House of Representatives. This means that legislation generally sails through this Government controlled House. The Senate chamber of the Parliament provides restraint on the power of the Executive. The people who wrote our Constitution believed that a strong Senate was so important that they enshrined it in section 53 of our Constitution. Apart from not being able to create or amend Bills relating to tax, revenues or money, the Senate has equal power to the House of Representatives. The framers of the Constitution intended that the primary role of the Senate would be to protect the interests of the less populous states in the federal Parliament by giving equal representation to all states. As was foreseen by some of the framers, soon after Federation parliamentarians began to vote as members of political parties rather than as representatives of states. While this has obscured the role of the Senate as a protector of the less populous states, the state-based system of representation has ensured that legislative decisions are not made only by the representatives of the more populous states. The Senate has also assumed greater importance as a check on the power of the government of the day. The framers’ design of the Senate has enabled it to perform this role effectively. In recent years more independents, minor and micro party Senators have been elected. Have the electors in the States voted for these Senators to look after their States? Or is it more issues based? 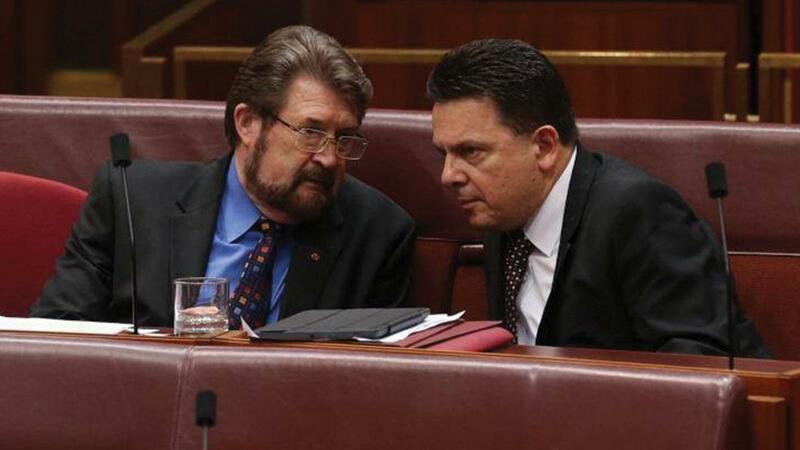 Some commenters say that the high Xenophon team vote in South Australia was about protecting the State, while votes for Derryn Hinch were more issues based (on the justice system). I looked the Prime Minister in the eye. I have not horse traded on one thing. I don’t personally benefit out of this, my party doesn’t benefit out of this, this sounds corny and I’m sounding like a politician, I hope the country benefits out of this. I haven’t done any Leyonhjelm and the ABC, I haven’t done anything with water as Xenophon has, though that may be beneficial, but I’ve just said this is what I think is right and that’s what I’m trying to stick by. Is it fair enough for some of this horse trading to occur? Is it such a bad thing that Nick Xenophon looks after the water concerns for his State? Is it fair enough that Jacquie Lambie tries to reduce the level of tax for backpackers so that she can assist Tasmanian farmers who are trying to encourage people to come and pick their fruit? Some Australians do get cranky about this kind of thing. But the electors in South Australia and Tasmania are probably quite happy. Democracy is sometimes messy. Negotiation is essential as power is spread across our institutions. The power of the Parliament is on par to the power of Executive Government. They have different roles, but they are each important to us, the people. The Senate (including the large number of crossbenchers) ensures that different Australian voices are taken into account when legislation is being created and then voted upon. As always we welcome your comments.